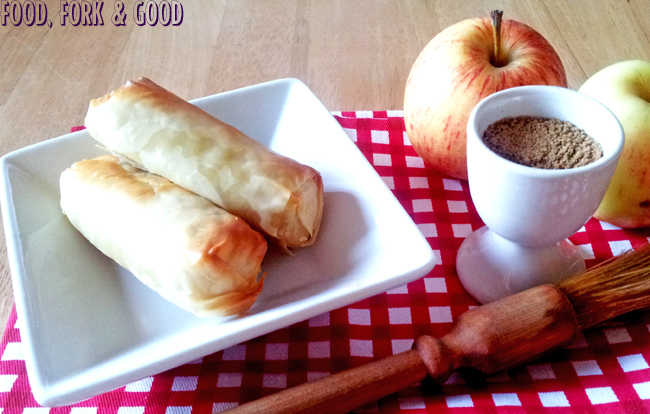 Spiced Apple Pie Rolls - Fork and Good. It's going to be a short one today, I have a busy week ahead, and my to-do list is about 12 miles long. Not that you're here to read about my to-do lists or hectic week. You're here to see some pictures of food, and I don't blame you, after all this blog isn't called Boring, Lists & Appointments. It's food, Fork & Good. Good food, and...forks. Before I ramble off in an odd direction, I'll reel myself back in and tell you about these babies. Apple pie Rolls. 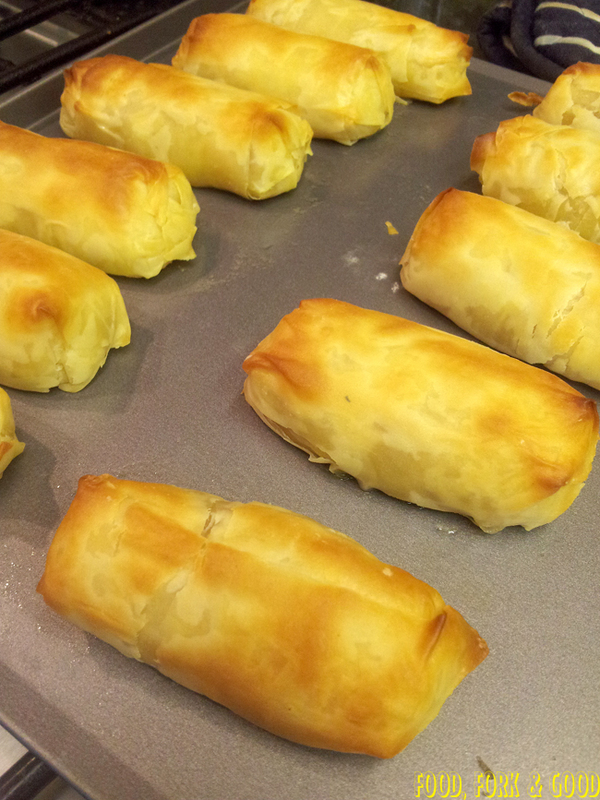 Yes, they look like spring rolls, but bite into one of these flaky treats and you'l get a sweetly spiced apple filling instead of a savoury filling. There's hardly any ingredients involved. In fact, pretty much every ingredient I used is in this picture above. So you know it's awesome, it's simple, easy & yummy. As usual, it's low on the old calories too. Each roll comes in at 2 Pro Points. 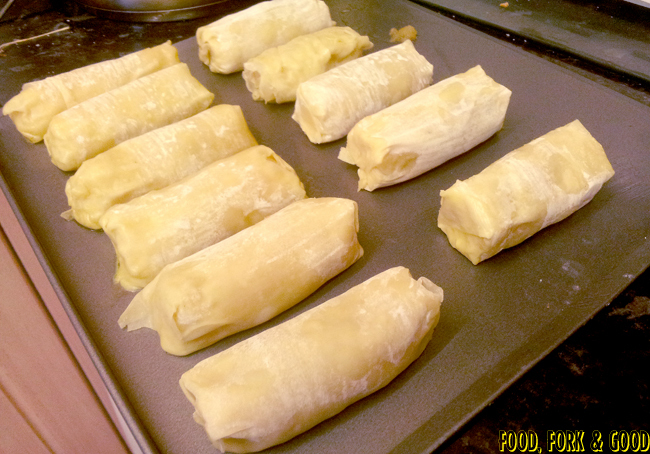 I didn't make the Filo pastry used in this recipe. First off, I'm not a miracle worker, and secondly, shop bought to me, tastes much nicer than anything I could make... It's a tricky pastry, but if you can make it, then feel free to sub that part of my recipe for your own. Also, I bow to you, as you are awesome. Empty the cans of apple into a saucepan with the cider vinegar, water, mixed spice & apple. Leave to simmer on a medium heat for about 15 minutes, stirring often. Once it's heated & has started to thicken slightly, take it off the heat, and put it through a sieve (don't push on it) and leave it to drip, in the sieve on top of the saucepan, whilst you prep the pastry. This part bit might come across as complicated (i'm not good at describing) but I promise it's not. Once you've rolled it to the end seal with a little butter, place the roll onto the top of the other sheet and repeat the process. Once it's rolled in it's second layer of pastry, seal with a little butter, dabbing some onto the ends and outer layer, place onto a greased baking sheet and repeat the process again with the other square half from earlier. Repeat this until you have your 12 pie rolls on the greased baking sheet (or 11 if you dropped one like I did). Brush a little butter or oil onto the tops. Leave to cool for 10 minutes before serving. They go very well with toffee sauce, ice cream, single cream, frozen yoghurt and golden syrup. That's just a few suggestions, for the teeny 2PP, have two! Both deserve a big shout out as both are on my must read list, so I feel kinda honored that they chose to nominate me. Before I flutter off into big ego land, I highly suggest you take a look at these guys blogs. Miss messy takes beautiful pictures that make me drool (Check out the sticky pecan tart) and Laurie's Cravings, this girl knows how to get me craving some healthy food (A must see: Jalapeno Jelly and Brie Crescent Bites). Her blog is such a great help, especially with my diet the way it is. Check them both out! 1. Thank your nominator (and link back!). 2. Nominate 5 other blogs, with less than 200 followers and post a comment on each blog letting them know they have been given the award. Check them all out, their blogs are fantastic =] See yah next time! Okay, A couple of friends told me to start up a separate blog where I could write to my hearts content about food. So I tried it and loved it. I really wanted to connect with other food bloggers and improve my own skills in the process. I've had chats with some really interesting people, all over the world, how can that not be cool!? The apple rolls look delicious! I need to give these a try! Also, Thank-you for the award. I'm so touched! What a great idea, love those apple rolls! And congrats on your awards! So honored!! Thanks Emma! You are such a sweetheart. 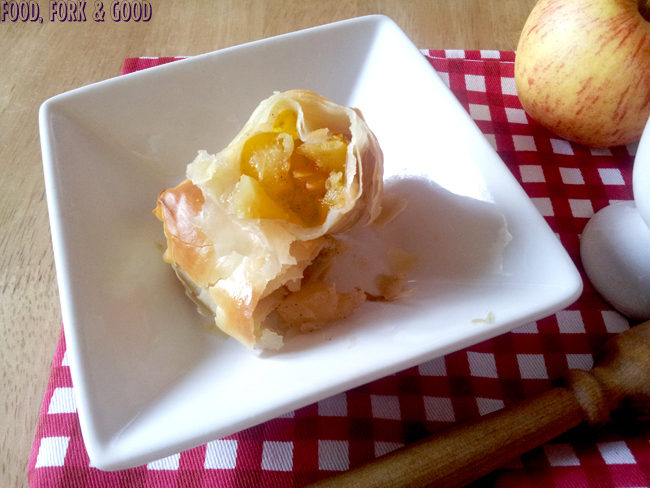 These applke pie rolls are so creative! These look amazing! I am drooling here just looking at them! Wow, those look amazing and I'm pleasantly surprised how healthy they are! Those apple pie rolls look very mouthwatering. I'd love a bite of that right now hehe. I'd still read on even if your blog was called boring, lists and appointments because I can relate (my to do list is equally as long at the moment). Love these little bundles of goodness. Thanks P&P =] Glad I'm not alone in it, I'm manic! Yum! These apple pie rolls sound amazing. 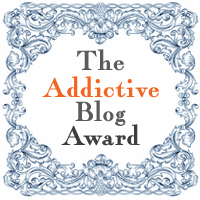 Congrats on the blog awards! I also wanted to stop by and let you know you won the Thoroughly Modern Milkshake book. Woo hoo! Stop by my site for details. Congrats on the award! Though apple pie rolls sound amazing! 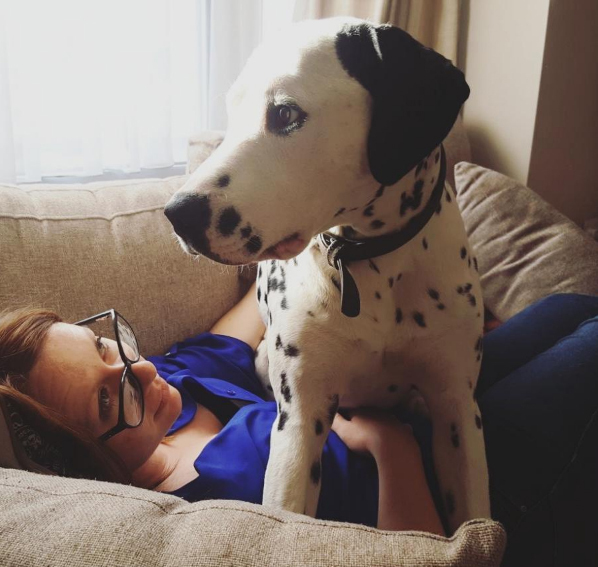 Hi Emma, now it's my turn to nominate you for the well deserved Awesome Blogger Award. See my blog for details. Congrats on your awards, they are well deserved!! 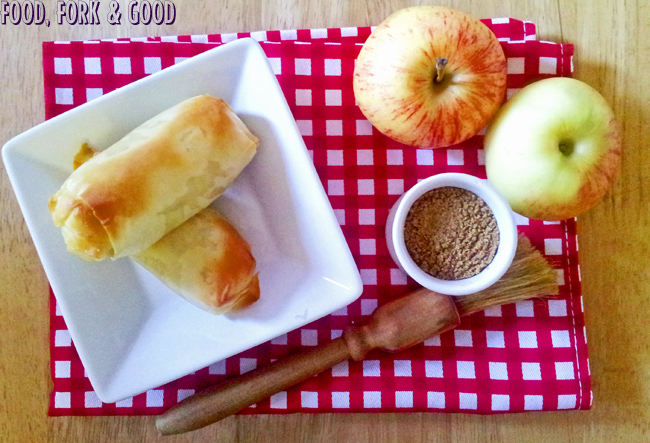 Yum, I am loving these apple pie rolls, gotta give them a try soon!! Thanks =] Hope you like them! They are very easy, but look pretty snazzy. Hence forth, lots of compliments =] Hope you enjoy them! Nothing wrong with store-bought pastries. I actually love them. These rolls look divine! The apple pie rolls look yummy! This is something I would like to try. Congratulations on the award. Wow! Talk about a tasty treat :) Congrats on the award. 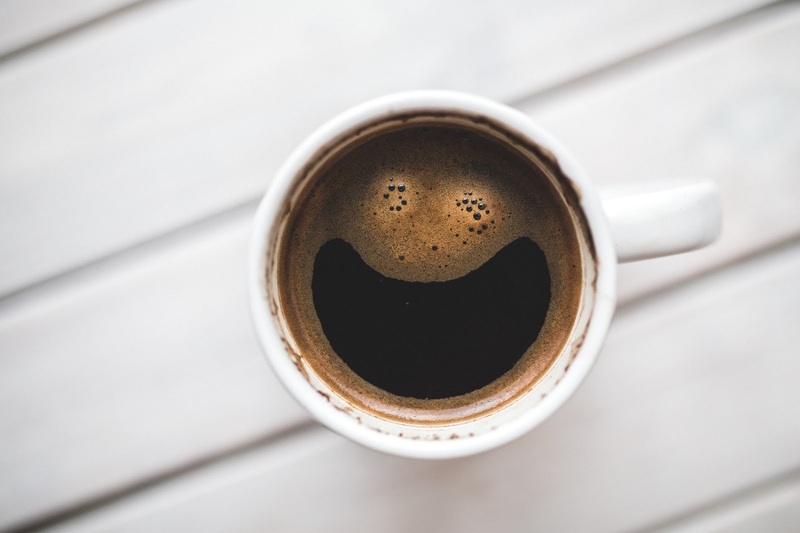 I love your blog and am now following! Oh man, just look at that crustiness! I need to get on this ASAP. These look perfect! I have a whole stack of apples that need using, so I`m always looking for new apple recipes. YUM! Something my husband and kids would love! I'm your newest Follower! Love your blog!!! Drop by and visit me when you get a chance at www.theredapronscravings.com. Thanks so much for the award! Very kind of you!